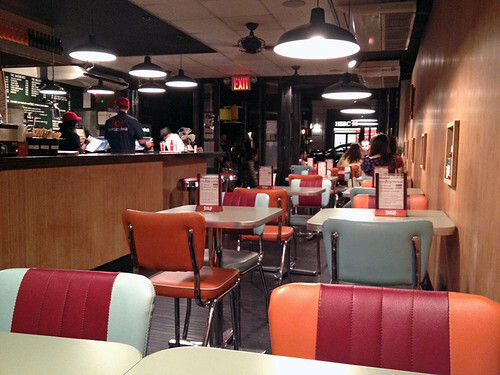 I was expecting one of those modern choose-your-own-toppings trendy chain burger joints, but when I walked into Joy Burger Bar I was greeted instead by nice old-fashioned charm! From the old menu board and other signage to the tables and chairs, this place had great character. You still choose your own toppings here, and their slogan is “the sauces make the difference” because they offer a wide variety of sauces – I went with the spicy mango chutney! 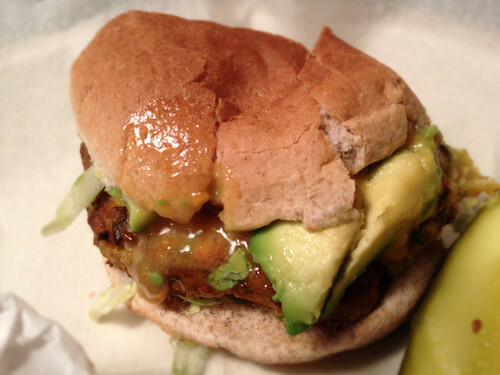 I asked if the burger was vegan, and they couldn’t tell me if the bun was or not (so possibly/likely not), but they showed me the label from the store-bought veggie patties that they use. They are made by a company called Maplecrest. 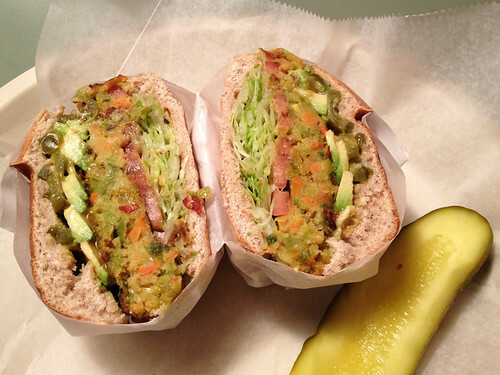 I thought I would be able to google them and find them online, but no luck so far – has anyone else heard of these veggie burgers? Do you know if they are vegan or not? 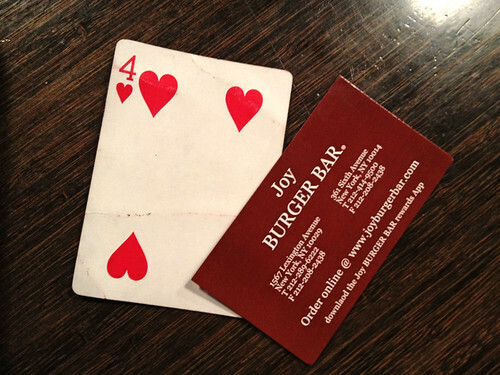 After you place your order, you get a playing card instead of a number to tell when your order is ready! The bun was whole wheat – soft and fresh, but not toasted. Just your basic bun. The patty tasted very starchy (potatoes? Rice?) with bits of carrots and peas. It was very soft, and kind of bland. Luckily, the toppings made up for the lack of flavor – I had chosen lettuce, tomato, jalapenos, and added avocado for $1.25 extra, because why not? Those alone are great toppings, but the spicy mango chutney stole the show. More sweet than spicy, I loved this chutney! I could put it on everything and eat it by the spoonful, seriously. It totally elevated this burger to a more enjoyable level. 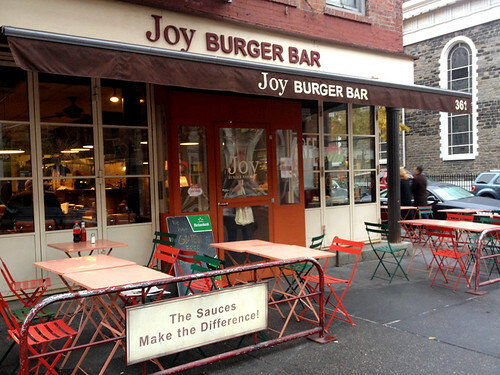 I love Joys Burger Bar, the extras are a little pricey though! LOVING your blog! First time visitor and commenter! I'm now a follower, too! Nice place you have here! Love hearing about all of the places you find! Huh, never even heard of this place before! Such a shame that the burger wasn't exactly thrilling. It looks so colorful, and the toppings are pretty brilliant, so I really was hoping it would all add up to a new spot worthy of a trip. I know this is years later but ... yes, the Maplecrest patties *are* vegan. I also have been trying to find them online, but haven't been able. I did find a cafe that served them and confirmed they are vegan.